Missing teeth can occur for many reasons including age, disease, injury or daily wear and tear. The blow to your self-confidence, not to mention the inconvenience and damage to surrounding teeth and bone over time, is usually enough to encourage most patients to seek today’s modern alternatives to tooth loss. In the past, the best solutions for missing teeth were a dental bridge, removable partial dentures or full dentures. Over the years of successfully treating patients with tooth loss, we’ve heard all the complaints about dentures. Dentures make it difficult to interact socially, chew properly and are difficult to maintain. Today, we are able to offer patients in Atlanta, Sandy Springs, Smyrna, Vinings and the surrounding communities who have missing and damaged teeth a solution. Most patients are successful candidates for dental implants. Dental implants can be done any time after adolescence or when bone growth is complete. Certain medical conditions, such as active diabetes, cancer or periodontal disease, may require additional treatment before the implant procedure can be performed. The most common dental implants are made of titanium, which is a biocompatible metal. The implant is treated to increase the surface area and the integration potential of the implant into the bone. The dental implants we use at Aesthetic & Implant Dentistry of Atlanta of Atlanta use growth factor proteins (PRFG) derived naturally from your own plasma to enhance healing. Because there are so many different implant systems available to dental specialists today, it is important that proven and researched systems are used. You can be assured that we use materials that have been thoroughly tested and researched. We want our results to last a lifetime and take no cost cutting steps. 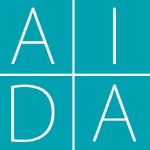 The AIDA dental team wants only the best for our patients. Our doctors spend a great deal of time, effort and continuing education to make sure we stay abreast of the latest technology, research and materials for all of our dental implant procedures. As you research dental implants for your tooth loss problem, you may have seen a multitude of ads from dental centers that advertise the $500 dental implant. Our advice is to be wary of bargain dental implant centers. The old adage, “you get what you pay for,” may apply. Use careful planning and research when contemplating any medical or dental procedure. You want only qualified centers and specialists addressing your dental implant procedure. Dental implants provide the solution for tooth loss that is permanent and carefree. Whether you are missing one tooth or multiple teeth, dental implants resolve the embarrassment of an unattractive smile while promoting long-term oral health. Think of dental implants as artificial tooth roots. Dentists use those artificial roots as the foundation so they can place a single tooth, multiple teeth or stabilize dentures. There are commonly three parts to what is described as an implant. 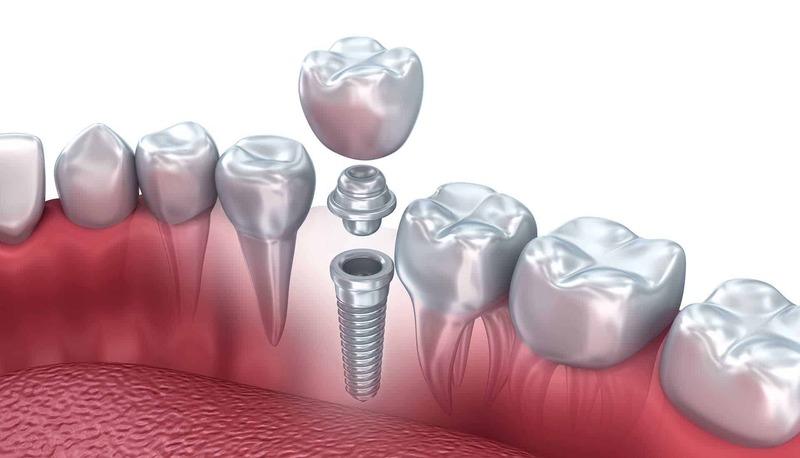 These parts are the implant device itself (which is inserted directly into the bone), abutment (the piece that connects the implant device to the third part) and the crown or dentures. Today’s dental implant restorations are virtually indistinguishable from natural teeth. This appearance is aided by the structural and functional connection between the dental implant and the living bone. Implants are typically placed in a single sitting but require a period of osseointegration. Osseointegration is the process by which the dental implant anchors to the jaw bone. Osseointegrated implants are the most commonly used and successful type of dental implant. An osseointegrated implant takes anywhere from three to six months to anchor and heal, at which point your dentist can complete the procedure by placing a crown restoration. If osseointegration does not occur, the implant will fail. Your actual dental implant surgery is done by our partnering oral surgeon. Local anesthesia is usually adequate for these out-patient procedures, but various other forms of patient sedation (such as nitrous oxide and oral/or intravenous sedation) may also be used. Many patients sleep through the procedure, which usually lasts under one hour. The most widely practiced method of placing dental implants is a “staged surgery” procedure. The first stage consists of surgically burying the implant (which replaces the tooth root) even with the bone but underneath the gum. This protects the implant from force while it is healing. At the end of this healing period, the implant needs to be surgically exposed by removing some of the overlying gum. At this second stage, the surgeon checks the implant for its successful integration. They then will connect some form of post that penetrates through the gum into the mouth. This post is called the abutment. Abutments come in many forms and can be stock-manufactured or custom-molded by your dentist and a laboratory. The gum is allowed to heal around the abutment and form a cuff or collar. This is through which the dentist has access to the implant when preparing the final restorative stage of placing the prosthetic tooth or teeth. Research has shown that it is often possible to place a suitable abutment at the same time as the implant. This has certain limitations but can eliminate the need for a second surgery to expose the implant. However, the implant still requires adequate healing time for the bone to osseointegrate. The abutments must also be protected from chewing forces during this period to assure effective bony integration and successful healing. Once the implants have had a chance to heal and tested for successful integration, the final restorative step takes place. This stage consists of fabricating and connecting the prosthetic teeth to the successfully osseointegrated implants. Many patients researching dental implants have heard of such phrases as, “Teeth in a day.” While those procedures are commonly used, the success depends on many factors, including the patient’s preexisting conditions. Your dentist will help explain both procedures and determine which one will give you the greatest percentage for a lifetime dental implant with few complications and problems. This method employs a non-submerged, one-piece implant that has a metal collar designed to protrude through the gum while the bone is healing to the implant. After a suitable healing time, an abutment can be connected to the implant, allowing for fabrication of the crown to replace the missing tooth. The one-stage technique can be achieved by immediate connection of a temporary healing abutment to a two-piece implant that protrudes through the gum in much the same way as a one-piece implant. Both single stage and two-stage implants have similar success rates. You should ask your dentist which systems they use and discuss how one or two-stage procedures might be appropriate for you. While a tooth supported bridge is a reasonable choice, it does have some significant disadvantages over a dental implant. For example, with a three unit bridge, your dentist must grind off the enamel of the two adjacent teeth to cement the bridge in place. This process can lead to decay of those teeth. In addition, human bone needs force applied against it in order to stay healthy and in place. With a three unit bridge, the missing tooth is replaced with a “floating” tooth suspended between two crowns. This is called a pontic. Because the pontic does not apply force on the bone, the bone melts away over time. This can lead to destabilization of the adjacent teeth, hygiene issues and cosmetic challenges. In contrast, an implant recreates the natural anatomy and applies force to the bone. This keeps the bone healthy and in place. It also allows your dental implant specialist the ability to leave the adjacent teeth alone. Research indicates that most tooth supported bridges fail within fifteen years, often even sooner than that. While most implants, when integrated, can last a lifetime. When you consider the lifetime value, lack of bone loss, cosmetic look and not having to grind down healthy adjacent teeth, the choice most people make is to have the dental implant. There are two other choices a patient can make. One is a removable bridge, but this is not a very attractive choice. Most dentists only use it for temporary reasons. The only advantage it has is the price. The second choice is a Maryland bridge or resin bond. This solution does leave the adjacent teeth alone, but these often fail and have to be re-bonded over and over again. They also do not address the bone loss problem. Missing teeth should be replaced as soon as possible, and the method of choice for replacement is the dental implant. We have prosthodontic specialists at Aesthetic & Implant Dentistry of Atlanta who are specifically trained to ensure that your implant is long-lasting and beautiful. Contact us today to schedule an appointment for a consultation.